National Grammar Day is observed in the United States annually on March 4. It was established in 2008 by Martha Brockenbrough, an American author whose book Things That Make Us [Sic] is dedicated to common grammar mistakes. She is also the founder of the Society for the Promotion of Good Grammar (SPOGG). According to Brockenbrough, the main goal of National Grammar Day is to help students with their grammar in a lively and positive way. Language is not something to be afraid of, it is something to be celebrated, and National Grammar Day is the perfect day to do it. 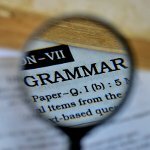 A lot of teachers, editors, journalists and writers celebrate National Grammar Day with blog posts, lessons and lectures dedicated to the subject. National Grammar Day events are designed to demonstrate that grammar studies don’t have to be boring. How can you celebrate National Grammar Day? There are different ways to participate. You can take a grammar quiz to test your knowledge, take some grammar lessons, read a book on grammar, or teach other people the things you know in case you’re a grammar guru. You can celebrate the holiday even if you live outside the United States and/or English is not your mother tongue, because grammar is important in any language!